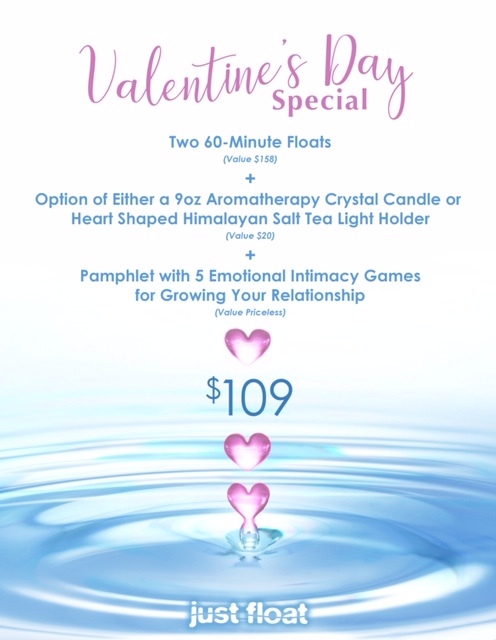 The Just Float Valentine’s Day Bundle is a unique & beautiful way to celebrate your unique & beautiful relationships. Whether your special someone is your partner, your dear friend, or a beloved family member, bring the gift of serenity into your lives. Floating is a beautiful experience and a fantastic Memory Making Gift to give to your special person this year. Imagine the look on their face as you give them the gift of ultimate relaxation. Will they know how great they are going to feel afterwards, how great it will feel to make time for themselves? Will floating be a whole new experience for them? Make it a float date! You each get your own private suite to de-stress in while you float away the cares of the world. And just after your float sessions, take the time to share about your experiences, perhaps discovering new things in common, and more of what makes you unique. Celebrate a new memory, together! Should you have any additional questions, please call us at (818) 639-3572 and a member of our staff will be happy to help you.